at what point in the flight to Howland would they need to turn around to get to New Britain? I ask as that i further west than the Gilberts and the thought is that they were a place to far? OK BUT if Itasca received a strong signal saying 'we must be on/near you' - sorry not exact quote so don't shot me, would if they were close to Howland/Itasca they have had enough fuel to make it back to New Britain? Chris, I think Gary was pointing out that they could have made it back to the Gilbert islands but not New Britain. Intersting to note though instead of Lae being used as a point of departure Raboul has been mentioned as a better alternative departure point, being closer to Howland. However, as Woody pointed out in a previous thread there was a double volcanic eruption near raboul on the 29th May 1937 with accompanying tsunamis consequently shutting it down until further notice. Vulcan erupted on 29th May 1937. Within a few minutes the eruption column reached a considerable height. Peleean-type pyroclastic flows moved laterally across the sea. Lightning was observed, and pumice fell from the sky like hail. Within 30 minutes ash started falling on Rabaul town. Boats were left stranded on Rabaul foreshore after tsunamis struck. Telegram to Australian prime ministers office on 29th May 1937 (Rabaul was administered by Australian government). "After continuous earth tremors since 4am this day vulcan island erupted about 4 pm emitting dense volumes of smoke and covering Rabaul with volcanic dust making day into night." I need a little help here, the way I understand it, you have to know where you are before you can get anywhere isn't that correct? I mean, in order to get to Point B, I have to be at Point A and know where that's at correct? So if I don't know where Point A is, how do I find Point B? Heres my thought, here they are, they have flown along a reasonably steady course for the correct amount of time at the reasonably correct airspeed. Point A becomes the 337/157 LOP. Only they don't know WHERE along that line they are. Now they cant find Howland along that line and they make the decision to go back to New Britain. If they don't know WHERE Point A is, how do you find Point B? I think that's very safe - Gary's put up very clear rationale. It's been spoken to before by Gary and others I believe. Add to that the radio traffic we do know of - 'must be on you' is not likely to have been many hundreds of miles off to west, etc. been a tad lazy in not re visiting GLP and others posts but was the gist I got. MALCOLM balls in your court to prove this one? Not my duty to prove or disprove the New Britain hypothesis and I have never claimed that I accept it over the other three I suggested, in fact elsewhere I have had a very long discussion with the main promoter of the New Britain hypothesis regarding the evidence, or lack thereof in the physical sense, as I have here regarding the evidence or lack thereof in the physical sense, to support the Nikumaroro hypothesis. The most interesting thing I find in the evidence quoted on the New Britain crash web site is the reference to the C/N tag found attached to the engine bearer of the wreck by the members of the Australian army patrol in 1945. Also interesting is that according to their lieutenant the USAAF said at the time that the aircraft was not a US military wreck. Now is the C/N tag a coincidence, is the wreck Japanese, a pre-war US civil aircraft or did the patrol make up the whole thing and quite by accident come up with that C/N tag number. My view is that there are four reasonably valid hypotheses and that we are yet to see any of them discounted by finding unequivocal evidence to support just one. Simple as that, and I am in no way criticising TIGHAR whose reporting of what they have found to date is always open and above board. It is just that despite that, or unfortunately, TIGHAR is yet to provide the final piece that will seal the Nikumaroro solution. I hope they do - so much work deserves a successful outcome. See POINT OF NO RETURN thread. I'm not sure what to make of the soldier's report of seeing a tag on an engine bearing "C/N 1055" - sounds a lot like NR16020's 'c/n' (Constructor's Number, i.e. Serial Number). Problem is, as Ric Gillespie pointed out in his contribution to the above article, engine numbers would not happen to match airplane numbers as a norm, and did not in AE's airplane's case so far as I can tell. I don't like to think that outfit made that up - but if they found such a thing I beleive the 'matching' number is a fluke. The C/N number is that of the aircraft not the engine - that is why it is attached to the engine mount which is a part of the airframe not the engine. It also was the airframe part that suffered damage in the ground loop. That is why it is so interesting, that C/N matches that of Lockheed's for Earhart's Electra. A coincidence? possibly, but something that is a worthy of a properly financed expedition to find. What saddens me about searches of this kind is that instead of pooling resources each group operates in competition with each other. EXCEPT that flying was NOT shut down into the airports around Rabaul because of the volcanic eruption. See prior post. 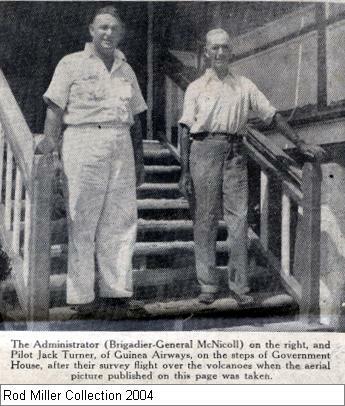 Here is a photo from a contemporary newspaper account showing that a plane from Lae had landed in Rabaul with the Administrator to inspect the damage. 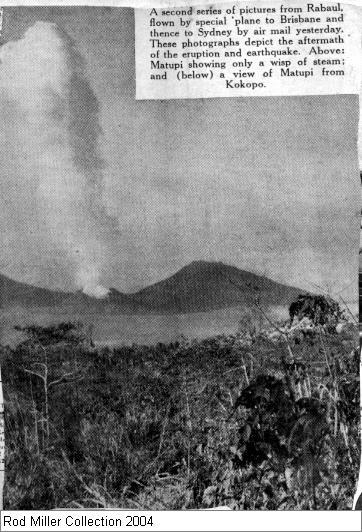 Here is a contemporary picture showing the eruption from Kokopo, the site of the second Rabaul airport and far enough away to not be affected by the volcano. The caption says that these photos were flown from Rabaul so it is obvious that flight operations continued during the eruption. 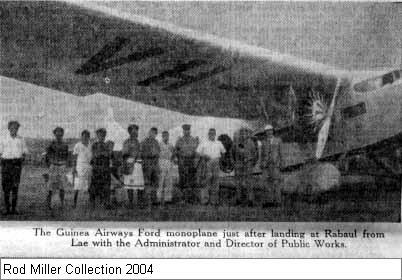 The third airport, Tokua, was even further away, it had a paved runway and had been built in 1928. What saddens me about searches of this kind is that instead of pooling resources each group operates in competition with each other. TIGHAR helped develop a search for a gravesite on Tinian. If you are offering funds from another organization to help TIGHAR with its work this year, I'm sure that the board will accept it gratefully as a precedent for "pooling resources." If you have a particular expedition in mind, you may apply to TIGHAR's board for support. The name of the group is "The International Group for Historic Aircraft Recovery." The Earhart Project is only one of TIGHAR's investigations. If you have a well-defined project, you may be able to persuade TIGHAR to help you. TIGHAR has pooled resources with others in the Devastator project and the Maid of Harlech. Vol. 3 #2, 8/15/87 of TIGHAR Tracks discusses TIGHAR's efforts to recover a B-17E from Papua New Guinea. I don't understand the connections, but TIGHAR has also worked very closely with Aviation Archeological Investigation and Research on various and sundry projects. No not offering funds and way past the age to be clambering around in jungles. Thanks for the reply - I was just making a general observation about the proprietary nature of these endeavours. In any case the C/N tag is a strange coincidence is it not. You've got it, you can't and that is also the problem with the Gardner island theory. It seems to me that before we can link a tag saying "C/N" to Earhart's plane someone must come up with evidence that it was the custom and practice at Lockheed in 1937 to use the term "constructor's number" or "C/N." I have never heard that expression before and I have kicked a lot of aluminum around. To me it sound like a British expression, not American, we use "serial number," "S/N." After they show that this terminology was in use at Lockheed then they also must show that it was the custom and practice to leave such tags on the engine or engine mounts of the planes they constructed or repaired. Good point Gary - like many of the various hypotheses there is always room for questions. But equally and as you say we don't know what Lockheed practice was at the time and it is a remarkable coincidence - unless it is a later hoax using an original map. That query can raise hackles but it needs to be addressed. And, and as with all of these, it is up to the proposers of the hypotheses to answer those questions. That is a good point you make about the starting position for the 157/377 line. If you don't know where you are how can you navigate to a known point. I have always found that radio message "we are on the line of position 157/337, we will repeat this message on 6210 kHz, wait …" hauntingly poignant. Now I am confused (happens all the time).. Doesn't the LOP of 157/337 become Point A? North and South it's an invisible highway, East and West it just marks a starting point doesn't it? I don't know how to ask what I'm thinking, so bear with me. If they knew they were on the line 157/337 and they are flying north and south and they suddenly turn West to back track, WHERE along that line would they have to turn to the West in order to reach New Britain? If they identified a landmark and fixed position, then they could have concievably reached Howland just as easily couldn't they?